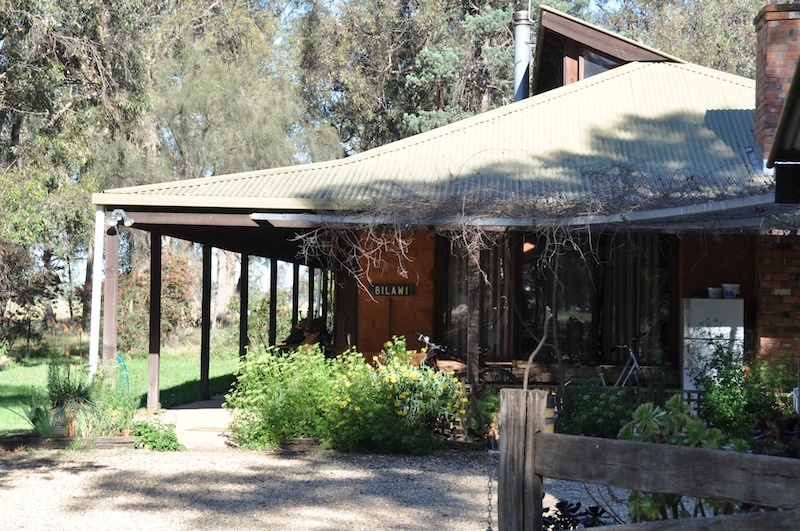 The farmhouse, Bilawi (Wiradjuri for "she oak") was built by the owners. They used timber from a local bridge, home-made bricks, and many recycled components. It was beautiful. 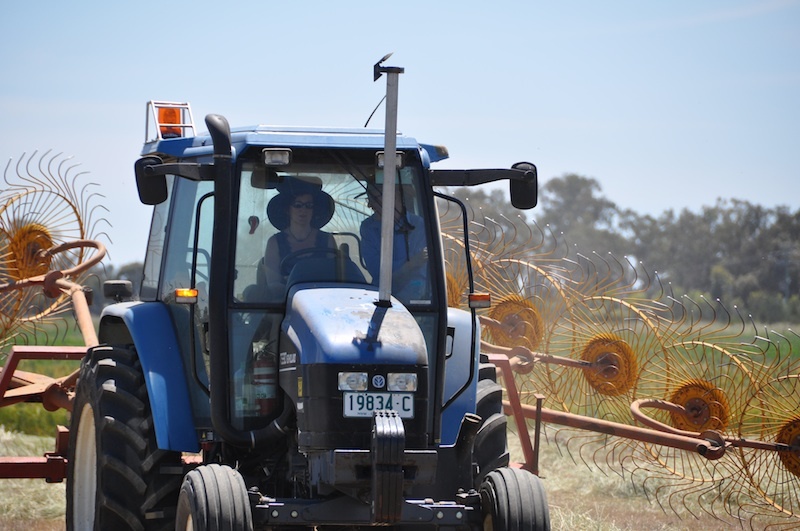 We have just returned from one of our most exciting weekend adventures yet – a trip to a real, live, working farm near Corowa. One of Lisa’s colleagues (LCP) invited us for a weekend away a few weeks back; she works at CSU in Wagga and commutes each week (Mon-Fri in Wagga and weekends back on the farm), keeping two homes in order while working as a full-time academic (whew!). Their family also runs a BnB on the property, called Oakleigh; it’s definitely worth the drive! This is Larry. Every time we would go outside, he would drop a stick at our feet. When this didn't work, he would drop it on our feet. Larry is very persistent. So, after a long workweek we followed LCP (caravan-style) to her rural home. And what a home it is! The drive was another lovely route, less than 2 hours drive southwest of Wagga; we stopped in Uranquinty for a late lunch at the Quinty Bakehouse (for meat pie – what else?) and to pick up some bakery provisions for the weekend. Our first evening was a quiet one at the farm. We first met the 6 (!) resident kelpies, who swarmed our car while yelping and jumping happily. Rascal, the old (retired) gentleman, peed on our front tire, claiming the Kia as his own. 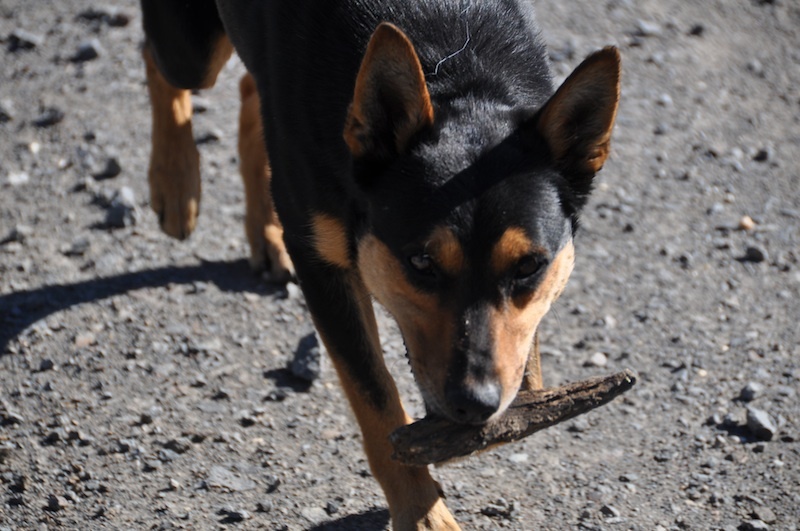 Larry (LCP’s daughter’s pet) promptly brought us a stick, begging us to play fetch; this would become a recurring theme throughout the weekend, with the “stick” ranging from a tiny sliver to a garden fence rail! He’s a bit obsessive, to the point that it might be a good project for a veterinary psychologist. It was a bit of a challenge keeping track of 5 kelpies (Rascal, the elder of the family, doesn't leave home these days) but it has to be done. The risk of snake bite is pretty high, and if one gets bitten they have to be rushed back to the farmhouse for some medication, then to the local vet within 2 hours. The owners aren't too happy with snakes - they've lost a couple of dogs over the years. 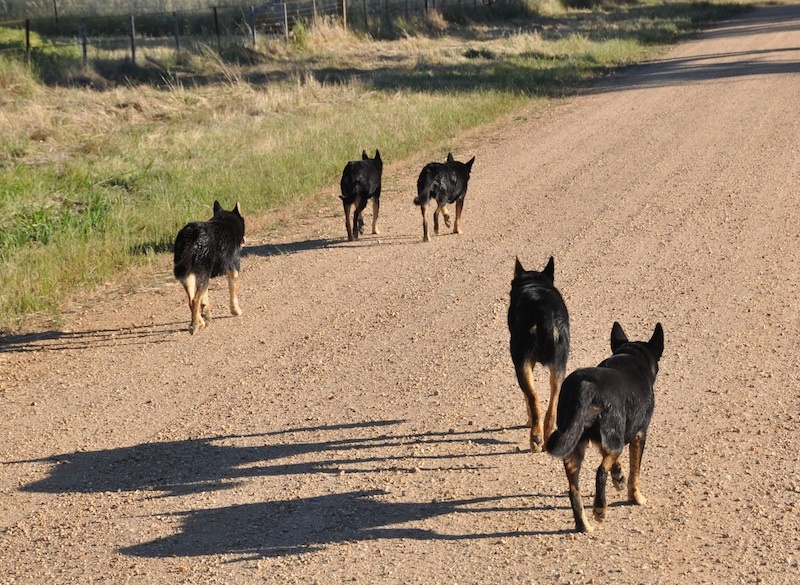 After a spot of tea, we decided to take the dogs for a walk around the property. We stayed on the road, since this is serious snake territory; in the Corowa area you can find lots of brown snakes, curl snakes and pythons. Happily, we didn’t see any snakes; we knew that they were there and had to call the dogs off of something interesting in the bush at one point (near the dam, where the snakes come to get a drink in the evenings). 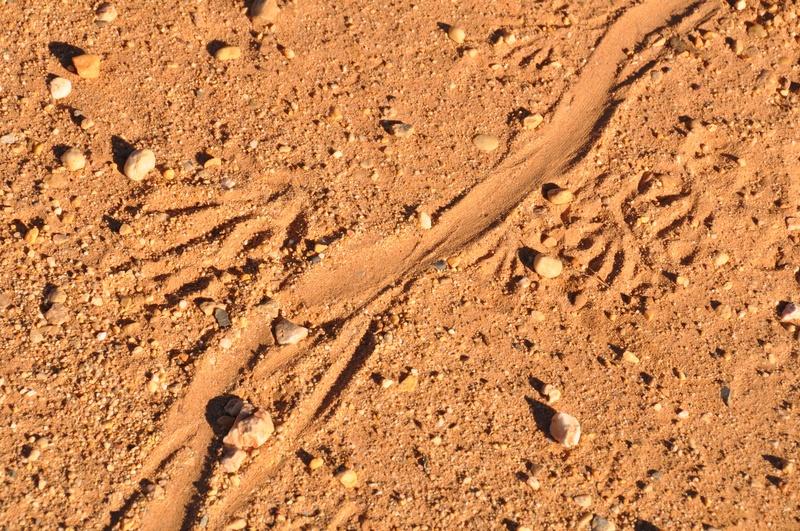 The property is also home to goannas, possums, and many, many parrots. The next morning we went for a 23 km bike ride around the neighbouring farms. It was early morning, so still cool and fresh (before hitting a high of 31 Celsius later in the day). Our bikes did very well on the harsh gravel roads; there was little traffic at that time of day, but we waved at all the utes that went by (just like rural Canada!). After grabbing a shower and a hearty breakfast (with mangoes and cherries and honey… oh my! ), we set out for a guided tour of the farm. Now, this wasn’t just any old tour, where the city folk are safely ensconced in an air conditioned vehicle, marveling at the colour of the hay in the fields. Oh no! This was a hands-on, get your hands dirty, do a bit of work while you’re here, kind of tour, led by LCP’s husband TP. We all piled into the first ute of the day, a CB-equipped, working vehicle; unfortunately, there was only one bench seat, so Dan had to (Dan edit: got to!) ride in the back (totally illegal, mind you; think of riding in the back of a pickup truck – but with lower sides – and you’ll get the picture). We didn’t go too far; just down the road a bit where we traded this ute for one with a crew cab. We didn't see any reptiles on the farm, but we were obviously very close to a goanna. This track across the road was still fresh (hadn't been run over by a car tire yet) when we walked over it. Then, it was off to paddock #1, where we met a fellow temporary resident, a field-hand named Luca, who had traded working on a dairy farm in Italy for this mixed (crop plus sheep) farm in Australia. He was busy using his tractor to rake hay into windrows, so that the crop could finish drying. This is where the real fun began! Dan jokingly mentioned to TP that Lisa had experience driving tractors; she had once driven a small John Deere tractor with a trailer full of beer at a party hosted by a former Dean of Nursing at University of Alberta, on the Dean’s farm (don’t ask!). TP thought this was just the right experience to train Lisa for having a go at raking hay, so off they went for a little bit of tractor work. As TP said, it was a good chance to see if the theoretician could do something practical! The answer? Why yes she can! Luckily, Lisa can drive a stick shift, so was able to master the clutch and gears (turtle vs. rabbit; they are labeled with pictures of these animals, so you know if you want to go slow or fast). She had to steer the tractor to keep it in line with the middle pile of 3 piles of hay, then lower and raise the rake at just the right moment to guide the 3 piles into one long windrow. TP declared Lisa’s windrows very neat and orderly (she is a trained librarian, after all – so what did he expect?). If the CSU job doesn't pan out, maybe Lisa can apply for a temporary, rural worker visa and go do some farm work. Next, it was off for paddock inspections. We toured the various crops and had a detailed lesson in the differences between wheat, triticale (a cross between wheat and rye), lucerne (what Canadians call alfalfa) and barley. We learned all sorts of information about the land, watering, cutting, etc. We learned, for example, that rainfall patterns in Australia are very predictable when there isn’t a drought – or even in a drought, really. TP explained that he planted one kind of barley on the west side of the road, because it got more rain than the one on the east. He detailed differences between farm areas around the region, and how just a 35 km difference can make a difference in what kind of crops are suitable. And the value of land, he said, was in how much rain it gets: when buying property, that is the key factor and farmers need to understand that when purchasing and planting. Modern farming technology is amazing. To plant in a straight line, the tractor is controlled by a GPS. When this field is sown next year, with a different crop, the GPS can be set so that the seeds are planted 25mm from this year's seed line. We also learned a lot – a hell of a lot – about crop rotation, mixed crop planting, cropping versus pasturing, and the techniques TP uses to manage soil quality. It isn’t an organic farm, which given the type of people they are was a bit surprising (LCP said that TP is sometimes referred to as a communist!). 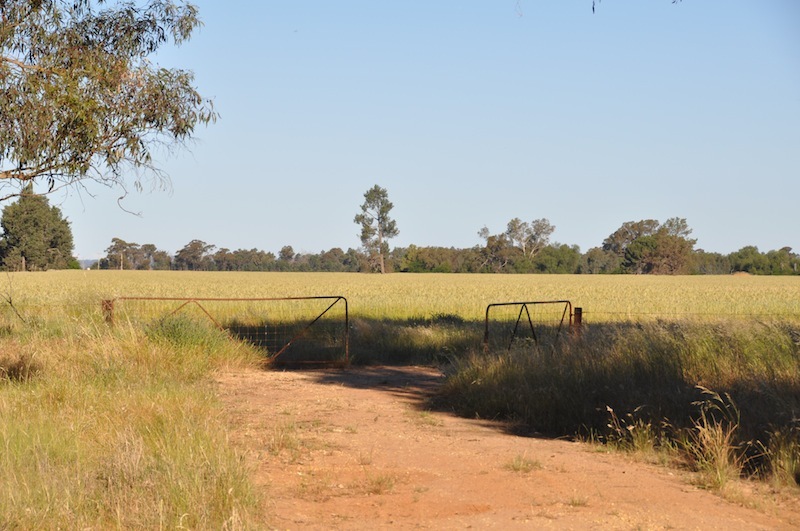 But there are a number of problematic crops that grow, and organic control methods such as plowing them under, aren’t sustainable in the Australian environment; as we mentioned in our gardening post, there is almost no topsoil here, and plowing the ground would be detrimental to moisture retention. So, minimal use of herbicides is necessary. This entry was posted in agriculture, Australia, Corowa, cycling, farming, kelpies, rural life, utes, wildlife. Bookmark the permalink.